mouse medicine: by george, HE'S got it! in little more than 1400 words senator mcgovern presents a compelling argument why the country must pursue this course. with only ten months remaining until the next presidential election, it is unrealistic to think that we will actually remove bush and cheney from office - nothing happens quickly in washington (except perhaps the ability of a certain band of rascals to "derail american democracy"). Impeachment is unlikely, of course. But we must still urge Congress to act. Impeachment, quite simply, is the procedure written into the Constitution to deal with presidents who violate the Constitution and the laws of the land. It is also a way to signal to the American people and the world that some of us feel strongly enough about the present drift of our country to support the impeachment of the false prophets who have led us astray. senator mcgovern is hardly alone in his position. but unfortunately there appear to be systems controlling the country which have a remarkable ability to shut down dissent and reason. one perfect example is consider the exclusion of presidential candidates dennis kucinich and ron paul from various candidate debates and forums. friday night bill moyers followed up the iowa caucus with by interviewing dennis and ron and political scientist kathleen hall jamieson. among the topics pursued was the intersection of the media and politics and the 'powers' which shape and influence both. it was a stimulating program and analysis; in case you missed it, here you go! *george is the name of my much loved grandfather, st. george the mythical dragon slayer, not to mention quite a few other fine individuals. pictures: 1972 mcgovern for president button from my button vault; protest in cleveland on march 20th 2006 - the third anniversary of the invasion. I saw Mr. McGovern debate Newt Gingrich at George Washington (there's another one!) University back in the late '80s. The subject was the invasion of Grenada, and George cleaned Newt's clock. He is a smart and honorable man, and well worth listening to on any subject. And he is, in my opinion, correct again. 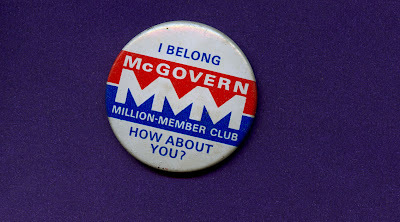 Mr. McGovern still has the fire and brilliance he had in 1972. If only the country had chosen him! Amy Goodman's doc "One Bright Shining Moment" sums up the lost chance with his campaign. Granted, she's a tad too admiring, but no politician today has McGovern's vision and bravery. Love McGovern, for all the things Ladron said--Len's cmment was interesting too-I would have loved to see Newt's creepy clock cleaned. I think I will name the next kitten who crosses our threshold "George McGovern"